The Coaction Lab at the University of North Carolina Wilmington in collaboration with Open Lab Research at the University of California Santa Cruz has collaborated with Maine artist and wooden boat builder, Reed Hayden to create a mobile art & science lab focused on water issues and ecology. 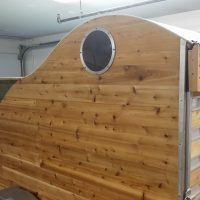 This lab was constructed using a combination of wooden boat building and digital fabrication techniques and is designed to house an array of art and science tools. 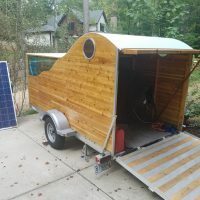 The Mobile Coaction lab (MCL) collects, visualizes and sonifies local water data and shares it through outdoor, multi-media, video projection mapping and light and sound based digital storytelling events. 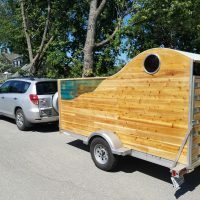 The purpose and primary objective of the Mobile Coaction Lab (MCL) is to explore the collaborative possibilities that occur when Artists and Scientists engage the general public through innovative public experiences that occur outside of museums, galleries and science centers. These types of experiences developed by the Coaction Lab have taken the form of outdoor art installations / exhibits / performances and large scale community events such as FLOW Fort Knox (www.flowfortknox.com) FLOW Bangor (http://coactionlab.org/flow-photos-and-video/) and Bloom Santa Cruz (http://lighthousebloom.com/) as well as a number of smaller interdisciplinary collaborative projects which can be seen on our website www.coactionlab.org. 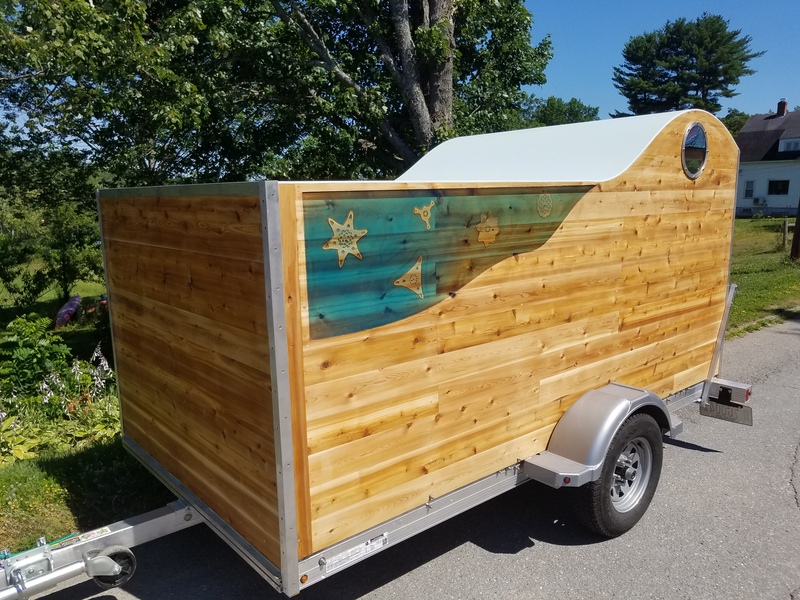 Phase 1 of the Mobile Coaction Lab (MCL) project was completed during the 2017/18 academic year and was focused on creating the mobile art lab trailer system, using a pre-fab aluminum trailer base to support a custom wooden trailer constructed from Eastern cedar, fir and aluminum for their durability and low weight properties. 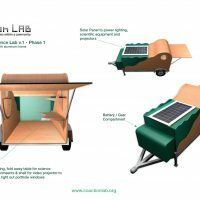 The lab transports both art and science tools such as video projectors, an immersive audio system, a mobile wifi system, a microscope, a 3D printer and an array of air and water quality sensors. 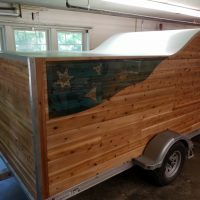 The Mobile Coaction Lab will also be used as a deployment system for the current version of Oceanic Scales (www.oceanicscales.com), allowing this modular art & science exhibit to be transported and set up in a variety of outdoor locations. 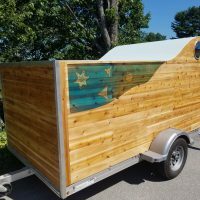 The trailer is solar powered with a 250-watt panel on the roof and a 200-amp hour battery / Pure Sine Wave AC inverter power system inside. 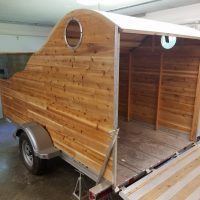 Phase 2 of the project will include the design and production of a series of fold away / hinged tables and shelves allowing the lab to be transformed from cargo space to creative work space. 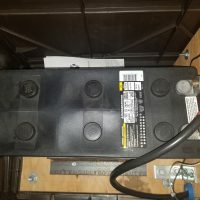 This next phase will also include replacing the aging, 250 lb. 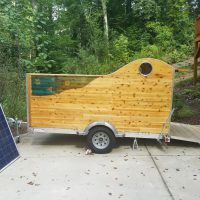 lead cell solar battery with a light weight and more durable Lithium Ion battery system. 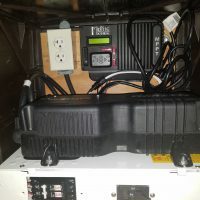 Lastly, the trailer will be outfitted with a wireless transmitting, water quality sensor system allowing the lab to collect water data (temp, PH, nitrates and dissolved O2) remotely and output it through both a high-lumen video projection mapping system and a built in RGB LED lighting system on the exterior of the lab. These visual data visualization and digital storytelling tools combined with an immersive audio system will allow the Mobile Coaction lab to translate data into a variety of multi-sensory formats, exploring the intersections between art, science and community.